A few tips to help you find the perfect trainers for Swimrun! The trainers you wear for SwimRun not only need to be comfortable for the long distances of technical trail running that you’ll be doing in your race but also need to be suitable for use in the water. Good Grip: Running with wet shoes on slippery rocks requires good traction. Make sure the shoe you choose has a good grippy sole – rubber spikes work well. Comfort: make sure your shoes fit you well and are comfortable enough for the distance you will be running. They need to be a snug fit so they don’t come off while swimming. Water resistance: since you will also swimming wearing your shoes, it’s also good if the shoes are as slim as possible to create minimum resistance in the water. Some people tape their shoes up to make them more streamlined! Drainage: you need the shoe to drain really well and hold as little water as possible. Think about the material the shoes are made from, thin mesh fabrics will not hold any weight compare to thicker padded shoes that soak up water like a sponge and then weigh a ton! If you’re really extreme you can even drill holes in the arches of the shoes to help the water drain! Don’t drill them in the sole – where water gets out water and dirt can also get in! Lacing: your shoelaces can become loose during the race, especially during the swims and it can be really hard to do them up again with cold hands. Be extra careful when you tie your shoes, using double knots and tucking the loose ends inside the shoe, or use elastic laces such as Locklaces. Sock choice: well drained shoes are no use of you don’t wear quick drying socks! Try out different socks to find some that don’t hold too much water. I find synthetic ankle socks are best for me and I never get blisters. When I was looking for shoes for my first SwimRun the Inov8 range where being hailed as the best shoes for the sport but they just didn’t suit my foot shape. I tried on lots of makes and model and eventually settled on some La Sportiva Bushido – they were really comfortable out the box, fitted well and looked like they’d drain well and float – both of which they thankfully do! I’ve also since tried the La Sportiva Helios and Icebug Acceleritas, both of which are great shoes for swimrun. Vivo Barefoot have recently brought out the Primus SG and call it ‘a pioneering land and sea endurance shoe’. It’s a very minimilst bare foot running style shoe so it won’t suit everyone, but if you are used to this type of running it’s well worth a look! Other makes that I’ve seen SwimRunners wearing are Salomon and Montrail. 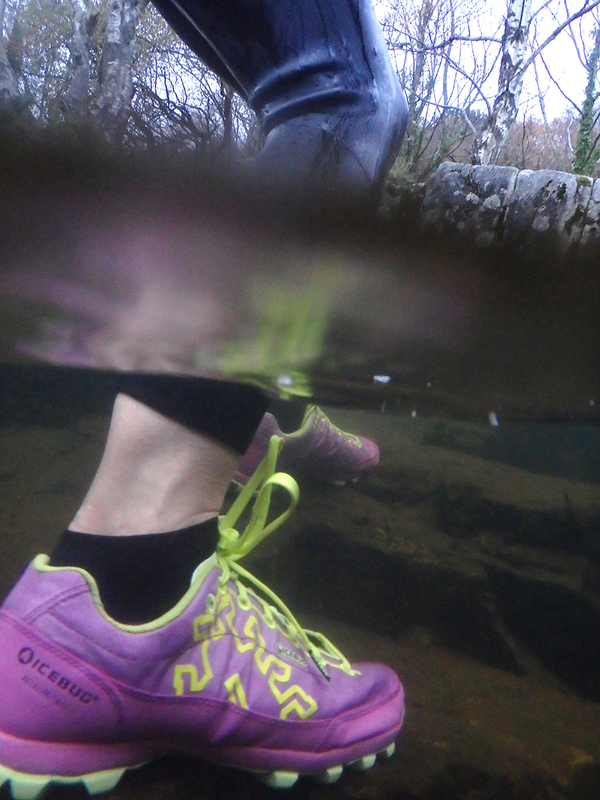 Whether you plan to swim in your trainers or carry them somehow on the longer swims is personal choice and very much depends on what you have been used to in your training and how wearing them effects your swimming times. Either way, make sure you wear your trainers in properly before the race day to avoid blisters! When your feet get wet the skin softens which makes them more prone to soreness and rubbing. Start by running short distances with wet feet and build up – they soon toughen up!